Proof that I may take too many screen shots. At some point more than a year back, I started taking screen shots of the ads that CCP puts up on the splash screen of EVE Online. I thought I might do something with them at some point. 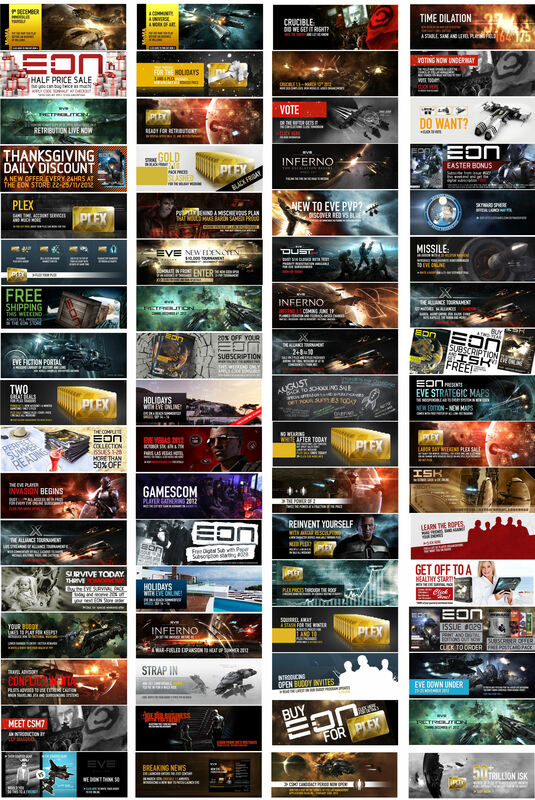 Today I went through the 3,000+ screen shots I have taken in EVE this year (it should be a long time before EVE Online Pictures runs out of material) and copied out all of the splash screen ads that I grabbed and put them into a single picture. I doubt this is anything like a comprehensive gallery of ads. I think at one point I stopped taking screen shots of the PLEX related ads. And there were a few with the loading alert up in front of them because I had logged myself in without stopping long enough to take a screen shot. Still, even with my abbreviated list, there are a lot of things covered. Selling PLEX and copies of EON are well represented, but so are events and expansions and new features and elections and so on. Not the worst way to view EVE Online in 2012. This entry was posted in entertainment, EVE Online and tagged Ads, Splash Screen on December 22, 2012 by Wilhelm Arcturus.